The first form of roulette was devised in 18th century France. Blaise Pascal introduced a primitive form of roulette in the 17th century in his search for a perpetual motion machine. The roulette wheel is believed to be a fusion of the English wheel games Roly-Poly, Reiner, Ace of Hearts, and E.O., the Italian board games of Hoca and Biribi, and “Roulette” from an already existing French board game of that name. 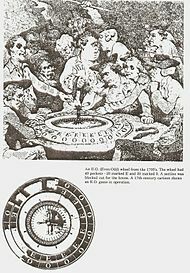 In 1843, in the German spa casino town of Homburg, fellow Frenchmen François and Louis Blanc introduced the single “0” style roulette wheel in order to compete against other casinos offering the traditional wheel with single and double zero house pockets. In some forms of early American roulette wheels – as shown in the 1886 Hoyle gambling books, there were numbers 1 through 28, plus a single zero, a double zero, and an American Eagle. The Eagle slot, which was a symbol of American liberty, was a house slot that brought the casino extra edge. Soon, the tradition vanished and since then the wheel features only numbered slots. In the 1800s, roulette spread all over Europe and the U.S.A., becoming one of the most famous and most popular casino games. When the German government abolished gambling in the 1860s, the Blanca family moved to the last legal remaining casino operation in Europe at Monte Carlo, where they established a gambling mecca for the elite of Europe. It was here that the single zero roulette wheel became the premier game, and over the years was exported around the world, except in the United States where the double zero wheel had remained dominant. Some call roulette the “King of Casino Games”, probably because it was associated with the glamour of the casinos in Monte Carlo. A legend tells François Blanc supposedly bargained with the devil to obtain the secrets of roulette. The legend is based on the fact that the sum of all the numbers on the roulette wheel (from 1 to 36) is 666, which is the “Number of the Beast”. In the United States, the French double zero wheel made its way up the Mississippi from New Orleans, and then westward. It was here, because of rampant cheating by both operators and gamblers, the wheel eventually was placed on top of the table to prevent devices being hidden in the table or wheel, and the betting layout was simplified. This eventually evolved into the American style roulette game as different from the traditional French game. 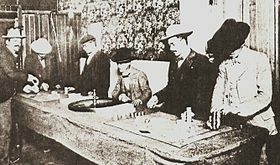 The American game developed in the gambling dens across the new territories where makeshift games had been set up, whereas, the French game evolved with style and leisure in Monte Carlo. However, it is the American style layout with its simplified betting and fast cash action, using either a single or double zero wheel, that now dominates in most casinos around the world. During the first part of the 20th century, the only casino towns of note were Monte Carlo with the traditional single zero French wheel, and Las Vegas with the American double zero wheel. In the 1970s, casinos began to flourish around the world. By 2008 there were several hundred casinos world wide offering roulette games. The double zero wheel is found in the U.S.A., South America, and the Caribbean, while the single zero wheel is predominant elsewhere.